Every SLP has lots of students working on auditory comprehension, so resources that target this skill are important. 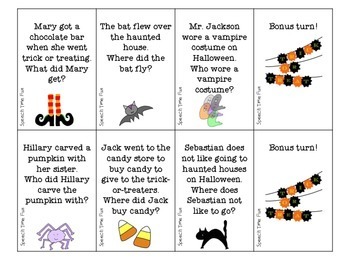 That's why I've created this fun activity, and as an added bonus, it's Halloween-themed! 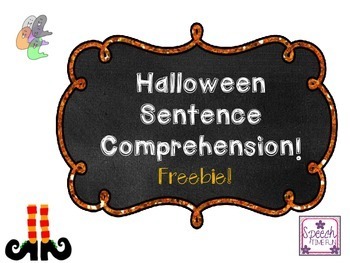 Working on auditory comprehension and answering questions has never been spookier! ★ Students will pick a card and listen to or read the sentence provided. ★ They must answer correctly in order to hold onto their card. ★ If they pick the “trick or treat” card, they get a bonus turn. "I used this so much with my language delayed students during the month of October. It was a very useful product and I continue to look for more like it so that I can easily continue to target this skill." "Great for those low level readers. Thanks, always looking for something they can participate in and it doesn't take forever to put together." 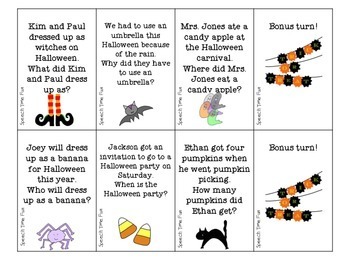 "I have so many students working on this...thank you for making a fun Halloween themed activity! My students will love it!"